Ayman al Zawahiri has sworn allegiance to the Taliban’s emir multiple times. The al Qaeda branch was established in Sept. 2014, bringing together jihadis who were already allied with Zawahiri’s organization. The new code of conduct explains that these same AQIS constituent groups “had been engaged in jihad in this region under the umbrella of Al Qaeda for a long period.” In addition to Afghanistan, AQIS operates in Bangladesh, Burma, India and Pakistan. It has been led by Asim Umar since its inception. AQIS “operates in obedience of the Amir of Al Qaeda (Central),” meaning Zawahiri. Since its “beginning” in 2014, the code of conduct reads, AQIS “has been engaged in jihad in line with the general guidelines of Al Qaeda” — a reference to the rules drawn up and disseminated by Zawahiri in 2013. These same guidelines “served as a basic resource during the preparation” of its new code of conduct, AQIS writes. While AQIS and its amir are openly loyal to Zawahiri, the al Qaeda master owes his own fealty to the Taliban’s most senior leader, who has been deemed the “Amir of the Faithful,” a title usually reserved for the Muslim caliph. Ultimately, therefore, AQIS’s allegiance passes through Zawahiri to the Islamic Emirate of Afghanistan as well. 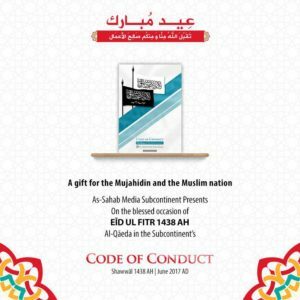 The “code of conduct” outlines the history of al Qaeda’s fealty to the Taliban, reminding readers that Osama bin Laden first pledged bay’ah (an oath of allegiance) to Taliban founder Mullah Omar. A screen shot of this summary, in English, can be seen above. After bin Laden’s death in 2011, the document’s authors note, Zawahiri “renewed this pledge” to Omar. AQIS ignores the inconvenient fact that Zawahiri and al Qaeda marketed their fealty to Omar well after the Taliban’s first leader had passed away in 2013. After the Taliban finally admitted in mid-2015 that Omar had died two years prior, Zawahiri “pledged his allegiance” to Omar’s successor, Mullah Mansour. But Mansour himself was killed in May 2016. So Zawahiri then repeated the same oath to the Taliban’s current emir, Mullah Haibatullah Akhundzada. The new code of conduct explains that AQIS’s men are integrated into the Taliban’s chain-of-command. “The mujahideen associated with the Jama’ah [AQIS]…are present on the ground under the emirate’s flag, and are actively participating in battles against the enemies of sharia,” the text reads. This helps to explain why AQIS has produced only minimal propaganda from the battlefields in Afghanistan, even though it is clearly contributing to the fight. In October 2015, for example, the US military announced that it had discovered what is likely the largest al Qaeda training camp in Afghanistan’s history. The camp was operated by AQIS with the blessing of the Taliban in the southern Shorabak district of Kandahar province. Shorabak was subsequently overrun by the Taliban earlier this year. In Dec. 2016, the US military explained that 250 al Qaeda operatives and leaders had been killed or captured in Afghanistan since the beginning of the year. This was two and half times the American government’s long-held, high-end estimate for al Qaeda’s entire presence in the country. AQIS believes that an American withdrawal from Afghanistan, signifying Western defeat, would be a boon for the jihadis’ cause throughout the Indian subcontinent. “It is our conviction that the defeat of America and its agents would result in victory for the religious forces in this entire region,” the code reads. While the war in Afghanistan is America’s longest, and there are many reasons to be skeptical about the future of the country, the enemy’s assessment must be weighed when assessing military options going forward. And AQIS thinks that an American defeat would be a clear victory for the jihadists, with effects that ripple throughout the neighboring countries. Al Qaeda’s choice of targets is often poorly understood, with some thinking that the group is myopically focused on plotting against the West, avoiding so-called “local” conflicts. This is incorrect for many reasons. And AQIS’s code of conduct shows that al Qaeda’s operations throughout the subcontinent have a broader strategy behind them. But the group quickly lists various other prospective targets who prop up the “oppressive British system,” which supposedly stands in the way of creating a puritanical Islamic state. People employed by other “non-Muslim” countries inside Pakistan will be attacked. Various arms of the Pakistani government are discussed as targets as well. “In the face of the secret machinations and plotting of Pakistani intelligence agencies and the open war being waged by the military, the people of faith have no course left other than fighting,” the code reads. Of course, it is widely suspected that parts of the Pakistani military and intelligence establishment, which supports the Taliban, is complicit in al Qaeda’s activities. While that is likely true, others within the government and armed forces are also fighting al Qaeda and some of its closest allies. Pakistan’s wheels within wheels environment means that some are opposed to al Qaeda, while others are aligned with it. AQIS unambiguously calls for attacks on the Pakistani military, prioritizing officers over mere soldiers, as well as anyone else in the military-intelligence establishment who stands in the way of implementing sharia. “All personnel of the military are our targets, whether they be in warzones or in the barracks at their bases,” or even on vacation, AQIS writes. Similarly, military targets throughout India, Bangladesh and Burma are all deemed appropriate. Zawahiri’s 2013 guidelines were an attempt by al Qaeda to lay down rules for waging jihad around the globe. These rules were grounded in a concern over how ordinary people react to seemingly random acts of terror and violence. Master insurgents learned long ago that in order to achieve their objectives they must win the support of a critical mass of the population. And AQIS’s code of conduct, which builds on Zawahiri’s guidelines, is peppered with observations and arguments from this perspective. “We avoid all such military operations that are beyond the understanding of common Muslims or repulse them away from the mujahideen,” the code reads. The al Qaeda branch argues it is “wrong to kill the wives and children” of “military personnel” in Pakistan and Bangladesh, even though the militaries in both countries are “strengthening the system of infidelity and fighting against the implementation of” sharia. This means that AQIS is opposed, at least in public, to some of the more heinous jihadi attacks inside Pakistan. Much of AQIS’s code of conduct deals with which parties should be targeted. Unlike the Islamic State, which advocates and directs violence against some communities purely as part of its bloodsport, AQIS argues that it has adopted a more targeted approach. This “system” is the aforementioned “British” order. Al Qaeda argues that various parties inside Pakistan and from the West seek to maintain this “system.” It supposedly stands in the way of AQIS achieving its goal — a state based on its radical version of sharia law. With this worldview in mind, AQIS wants its jihadists to avoid operations that are deemed unnecessary or counterproductive. For instance, AQIS argues that Muslim minorities — Shiites, Ahmadis, and Ismailis (referred to as “Rafidees, Qadyanies, and Ismailies” in the text) — are unbelievers and “their deviance” is “clear.” Yet, if they “do not wage an actual war against the people of” the Sunni majority, then AQIS will “not get entangled in a war against them.” Even if such a fight becomes necessary, then AQIS will focus on the leadership of the minority groups involved in the battle. Another point of divergence from the Islamic State can be found in AQIS’s attitude toward other jihadi groups. Baghdadi’s self-declared caliphate says that groups refusing to join it are apostates. AQIS takes a more inclusive approach, at least in its public rhetoric. AQIS wants other jihadists to adhere to its code of conduct even if they are not formally affiliated with the al Qaeda arm. When others violate the code’s terms, AQIS claims it will take steps to correct their ways. And Asim Umar’s organization invites “the groups fighting in the subcontinent to pledge their allegiance to the Islamic Emirate of Afghanistan, because a useful and constructive alliance in the region is only possible” through allegiance to the Taliban. Still, some points of contention shine through in the text. For instance, AQIS says it “will work with jihadi groups,” which are “independent from intelligence agencies’ influence,” in India, Bangladesh and Burma. Notably absent from this list of countries is Pakistan, where many of jihadi organizations, including the Taliban, have been allied with the military-intelligence establishment. Indeed, Pakistan’s proxy groups have often been al Qaeda’s allies. “The Kashmiri Jihad is a clear example of this,” AQIS warns. It is a telling comment, as the Pakistani state has sponsored the leading jihadi groups fighting Indian forces in Kashmir for years. Even though these same outfits share much in common with al Qaeda and the Taliban, al Qaeda doesn’t think they go far enough. In fact, a senior Kashmiri jihadist, Zakir Musa, has recently aligned himself with al Qaeda, rejecting the allegedly nationalist ways of his ideological cousins in the region. The end result is that while Pakistan’s sponsorship of jihadism has benefited al Qaeda, Ayman al Zawahiri’s men seek to further cannibalize the movement for their own purposes. And AQIS, with its “code of conduct,” is trying to further that effort. AQIS’s code of conduct ends with quotes from Mullah Omar, who called on Muslims to inspect the Taliban’s ways for themselves, and Osama bin Laden. The al Qaeda founder is described as the “Reviver of Jihad,” an honorific title that means bin Laden is credited with awakening Muslims to the necessity of waging jihad. Bin Laden called for the resurrection of an Islamic caliphate, and he thought the creation of the Islamic Emirate of Afghanistan was a key step toward this goal. Of course, al Qaeda’s 9/11 hijackings invited an American response, which led to the toppling of the Taliban in late 2001 — a blow for the jihadis’ caliphate-building project. “Today by the grace of Allah, we are going to revive the map of the Islamic World (1400 years old, encompassing three continents) so that by the permission of Allah, the complete Islamic world would turn into a single state under the banner of [the] Caliphate,” the quote from bin Laden at the end of AQIS’s code of conduct reads. AQIS clearly hopes that the Taliban will be able to revive its state inside Afghanistan. The Islamic Emirate of Afghanistan is closer to that goal today than at any point since Sept. 11, 2001. And it is a goal that AQIS is working towards. “The predominant or “mainstream Taliban” view is represented by the leadership’s official position; at present, it argues for the expulsion of Westerners from Afghanistan and also insists that the fighters respect rules of engagement and of conduct determined by the leadership itself. “Another viewpoint is more radical. It is hostile to leadership’s effort to impose rules of engagement, more inclined to utilize indiscriminate terror tactics, and more inclined to cooperate with foreign jihadist elements. Once led by Mullah Dadullah, who was killed in 2007, it has been in disarray since his death but was considered to be in the ascendency in 2010-11, despite the absence of a clear leader. “A third, small, faction displays pro-Iranian inclinations. Interestingly their propaganda doesn’t even mention the Islamic State, who also have killed members of the Taliban, who Al Qaeda effectively pledges to it’s leader. How is Zawahiri still alive? I mean we have a long list of their leaders that we terminated. Why is he not the #1 target, is he just really lucky? Of course , if Pakistan is protecting him they’re doing a good job so far. There would be a new #1 shortly after we eliminated him but at we wouldn’t have to listen to him anymore. “It supposedly stands in the way of AQIS achieving its goal — a state based on its radical version of sharia law”. What we learned as a Muslim is: mainstream Sunni Sharia law could be radical to some people but it has only one version. Moderate Muslims don’t support shariah law so it does not have a ‘moderate version’. “The new code of conduct explains that AQIS’s men are integrated into the Taliban’s chain-of-command.” ISI probably wrote the stupid code. The ISI run the Taliban, so this is a win-win for ISI. They don’t get the negative attention from CIA that working directly with Al Qaeda would bring and they get to run TB ops in AFG w AQ hitters. “AQIS says it does not indiscriminately target Buddhists, Christians and Hindus…” More lies!! AQIS sure does specifically target non-Muslims. They iced everyone in Holi Bakery who could not recite the Koran. PS The last sentence suggests that LWJ views TB controlled areas as quasi-AQ areas as well. Maybe we should just start stating that “the enemy” controls 90% of place X rather than splitting jihadi hairs. They all pray towards Mecca and sleep w children. You know what I always say: Kill them all and let Allah sort them out. Who cares what this rat Ayman Al Zawahiri does or says?